Considering Captain Behrend's ship spends as much as three months in Antarctic waters each year, his otherworldly description of the region certainly stems from a wealth of first-hand experience. 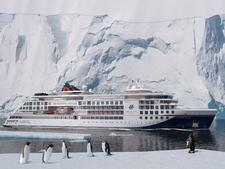 Looking at his rather impressive photographs from past Antarctica cruises during a meet-and-greet with the Hapag-Lloyd officer on Bremen's bridge, I find it hard to argue with his cosmic categorization. What the good captain doesn't say (though it can be easily read into his exuberant praise for the vessel) is that if Antarctica is a heavenly body, then you can call him Captain Kirk. That's because Bremen is cruising's version of Star Trek's Enterprise -- boldly going where few expedition ships have gone before. Hapag-Lloyd's small and nimble Bremen is made for visiting some of the most remote and exotic areas of the world. Itineraries for 2009 and early 2010 included trips to the Amazon, the Panama Canal, Japan, Russia, the Solomon Islands and the South Seas. 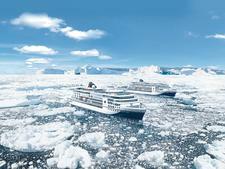 But Bremen's specialties are the Arctic and Antarctic, where the ship's enviable maneuverability and miniscule draught allow it to cruise through ice-filled waters and into crevices where larger and more traditional passenger ships fear to tread. 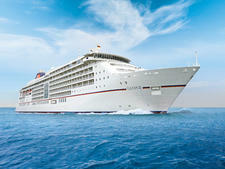 The 164-passenger Bremen is the smallest in the Hapag-Lloyd fleet, but may also be the toughest. With an E4 ice rating -- the highest ice class awarded to passenger vessels -- the 6,752-ton Bremen is well-equipped to handle the challenge of gliding amongst glaciers. While slightly more trimmed down than Hapag Lloyd's Hanseatic -- the world's only 5-star expedition ship -- the 4-star Bremen has plenty of amenities for a small adventure vessel, and passengers will certainly not be "roughing it" when onboard. 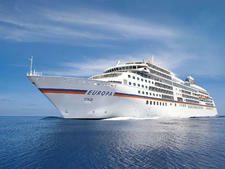 Built in 1990 and renovated in 2006, Bremen features a lounge, library, swimming pool, fitness center and beauty salon. Still, like most expedition ships, the focus here is directed outward rather than inward, rendering Bremen's rather drab interior and uninspired decor irrelevant when juxtaposed with the majestic scenery that can be found just beyond the ship's panoramic windows. Originally catering to strictly German clientele, Hapag-Lloyd has been marketing to an English-speaking audience for several years now. 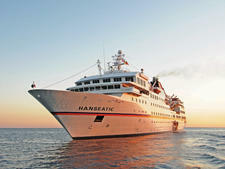 Bremen has offered between eight and 10 bilingual sailings per season in recent years and offered 12 bilingual cruises for 2009-10. In addition, regular cruises automatically become bilingual whenever six or more English-speaking passengers are booked onboard. And if you're the only English-speaker on a sailing not designated as bilingual, never fear: Crewmembers on all sailings are fluent in both German and English. The one and only restaurant onboard Bremen is a simple and elegant dining venue, though somewhat understated by cruise ship standards. Draped in neutral colors, the atmosphere never distracts from the meal and conversation at hand, and the room's dark wood accents and simple linens produce a conservative and very dignified experience. The restaurant is large enough to accommodate all passengers in a single seating, eliminating the need for multiple seating times at dinner. Open seating is observed during breakfast and lunch. As for cuisine, passengers from the U.S. and U.K. need not be concerned about being force-fed schnitzel and kraut on a daily basis. Hapag-Lloyd's German traditions go only so far when it comes to Bremen's menu. The food is not Germanic per se, though many dishes do have a noticeable European flair. In general, the menu for any given meal is eclectic and includes plenty of mainstream favorites that should appeal to Americans, Britons and Aussies, as well as to the line's German base. The chef also makes an attempt to infuse some port-inspired dishes into the culinary lineup. On a stop in New York, for example, the lunch menu included a New York Steak Sandwich. Granted, the open-faced creation didn't resemble anything we'd ever seen served in New York, but at least the folks in the kitchen made the effort. Aside from the New York "special," the menu offered plenty of variety, including cod and a respectable chicken cordon bleu. An apple soup, served chilled, was one of the more obvious European offerings. Meals begin with a visit to a small salad bar and end with a buffet-style dessert spread. A special menu for vegan passengers, or for those with food allergies, can be arranged. For more casual socializing and drinks, the Bremen Club on Deck 5 has an intimate bar area and periodically hosts musical entertainment. Bremen is a meat-and-potatoes ship, and the absence of bells and whistles is evident in the ship's 80 cabins. Dressed in pale and somewhat greenish hues (a tone that we thought was banished from the world's color palette after the 1970's), the rooms are neither festive nor particularly colorful. A regularly stocked minibar is included in each cabin, and room service, not always offered on other lines' expedition ships, is available 7 a.m. to 10 p.m. daily. TVs show a handful of English-language movies each day, and onboard lectures are rerun in both English and German for passengers who missed the live presentation. Basic cabins are pretty spacious by expedition-ship standards at 194 square feet, and -- in keeping with the ship's emphasis on constant exposure to the ship's scenic destinations -- all cabins are outside rooms and feature large windows, with the exception of those on Deck 3 which have only portholes. Deck 6 is home to 16 balcony cabins that do not otherwise differ much from the standard accommodations. Two 258 square ft. balcony suites are located on Deck 7 and offer the added perk of a small seating area and an upgrade to a flat screen TV. The onboard lectures are where it's at during a cruise on Bremen. Lectures are held in the roomy and comfortable Panorama Lounge, with boasts a layout that's half college lecture hall, half your living room. Depending on the itinerary, Bremen hosts local experts and scientists in various fields relevant to the locale, including ethnologists, marine biologists and historians -- with many lecturers accompanying passengers on zodiac landings and shore excursions. Considering that most passengers who book these sailings are in it for the learning first and foremost, these sessions are the most popular onboard activities offered by Bremen. The outdoor pool and sun deck is a relaxing place to spend down time on warm-weather itineraries (there tends not to be much sunbathing during Arctic and Antarctic sailings). Other distractions include a small fitness center with about five pieces of cardio equipment and a sauna. Bremen doesn't hold many surprises, and nothing onboard really fits in the "nifty" category. However, passengers are provided with an onboard e-mail account when they board, and e-mails sent to those accounts are free of charge (up to 10 KB in size) and delivered to them in their cabins. We thought that was a pretty cool perk for a ship that sails to the most remote corners of the Earth, making casual communication with the outside world a challenge for passengers. Expedition cruising in general is simply not for children or young teens. Bremen isn't built with kids in mind, and doesn't offer much for anyone too young to have an interest in science, nature and general learning. Though Bremen and the rest of Hapag-Lloyd's fleet has been marketed actively to English speakers for some time now, the effort to make Bremen as welcoming to U.S., U.K. and Aussie travelers as it is to German passengers still is lacking in quite a few areas. It's no surprise that onboard pricing remains in euros (though it adds to the expense for Americans, Hapag-Lloyd is, after all, a European cruise line), but some of the little things could be done better to enhance the bilingual sailings. While all literature -- menus, instructions, schedules, etc. -- IS provided in English, the translation can sometimes be a bit rough. The ship's library comes up short in the language equity department as well; when we were onboard the ratio of German books to English books was sadly one-sided (although we were assured that the cruise line is working on adding more English-language texts). Another head-scratcher is Bremen's miniscule "Internet Cafe," consisting of a single computer tucked into a tiny nook behind a boutique display case. In the Information Age, even a bare-bones expedition ship needs to do better (two more computers with Internet access were added in October 2008). And we would be remiss not to include a nod to the ship's decor in this section. An over-the-top, Joe Farcus-like Carnival Cruise Lines' interior design explosion is neither expected, nor appropriate, for a small adventure ship. But, seriously, some warm colors and something other than a few lonely flower prints as decoration might do wonders. Martha Stewart's jail cell must have looked livelier. Everything on Bremen is geared toward one goal: To give passengers the opportunity to see some of the most amazing sights the world has to offer. It's hard to imagine a ship better equipped to deliver. Bremen is designed to get you within an arm's length of those natural wonders, and the cordial and dedicated crew does everything possible to facilitate your enjoyment of the environment and activities. Passengers are often allowed on the bridge or into spaces usually limited to crew access in order to get better views of wildlife or to capture that perfect photo. The ship's officers have incredible freedom to change the itinerary on the fly, often incorporating more or different ports and excursions as conditions allow. Captain Behrend, in fact, confessed to making as many as 24 port calls on an itinerary scheduled for 16. That commitment to enhancing the cruise, along with the ship's talent for nimble maneuverings, makes Bremen an excellent choice for that rugged trip of a lifetime.